As you might expect, I speak with many senior executives and other job hunters on a regular basis. As we review their job search techniques and situation, the common refrain I hear is that they’ve set up a LinkedIn Profile, but then failed to do anything else with it. In many cases, I find that executives are only peripherally aware that using LinkedIn can help their job search, but they’re not sure what steps to take that will help them leverage it properly. Here’s the fact that you’ll need to face if you plan to find a job in 2010 or beyond: your online identity is already starting to eclipse your traditional resume. That’s right – a branded, search-optimization-friendly synopsis of your background on LinkedIn has become a requirement for finding your next job. The proof is in the results, as noted by this article that points out how Oracle’s new CFO was headhunted directly from LinkedIn. And that’s not all: the piece includes more advice on how recruiters can learn more about prospective candidates by using social media to track job hunter activities. And just to hammer the point home, here are several recruiters that publically noted their search methods in the LinkedIn Answers Forum, giving you a birds’-eye view on exactly how YOU might be found and recruited on the site! So quit focusing on your resume as the ultimate centerpiece of your search! You can have the most beautiful, well-written resume on the planet–but if it isn’t accompanied by a strong LinkedIn Profile, your efforts will stall quickly. 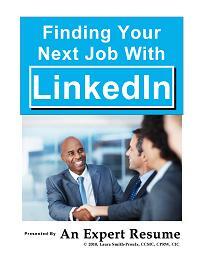 Want more information on how to use LinkedIn for job search success? Need to get a LinkedIn Profile up and running quickly? With full-service LinkedIn profile writing designed precisely around your goals, my client profiles accelerate job hunting results through search-engine specific keyword content that is tailored to your leadership brand. My newest book, Finding Your Next Job With LinkedIn, is also included to help you leverage the site to find new opportunities.